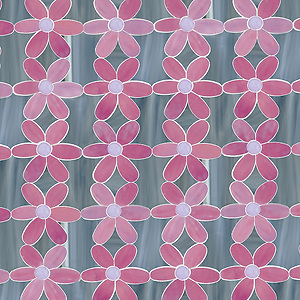 Flowers, a part of the Erin Adams Collection for New Ravenna Mosaics, is featured by Interior Design Magazine. Thank you to Interior Design Magazine for featuring Flowers by Erin Adams for New Ravenna Mosaics. To connect with Interior Design on Facebook, click here and follow @InteriorDesign on Twitter. 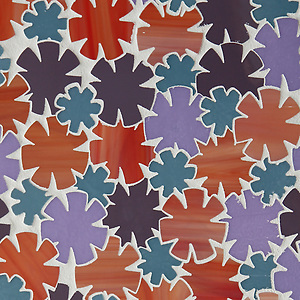 Flowers, a glass waterjet mosaic shown in Sonia, Rolly, Sardonyx and Alexander, is part of the Erin Adams Collection for New Ravenna Mosaics. 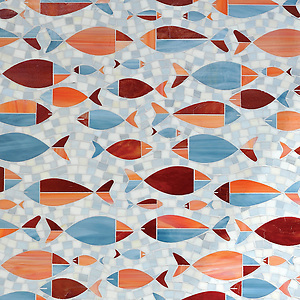 Floating Fish, a water jet and hand cut glass mosaic shown in Mica, Sardonyx, Pearl, Quartz,and Garnet, is part of the Erin Adams Collection for New Ravenna Mosaics.